FedMart was a chain of discount department stores started by Sol Price, who later founded Price Club. His first location in San Diego, California was in a converted airport hangar. It was originally a discount department store open to government employees, who paid a membership fee of $2 per family. FedMart's first year was highly successful. Over the next 20 years Fedmart grew to include 45 stores in a chain that generated more than $300 million in annual sales. The business expanded to several states in the Southwest United States. Many stores were previous White Front or Two Guys locations. Price later sold two-thirds of the chain to Hugo Mann, a German retail chain, in 1975 and was forced out of his leadership position the following year. FedMart went out of business in 1982. Sol Price began his career in the mid-1950s, when he worked as an attorney in San Diego. Fedmart began after he inherited a vacant warehouse for which he needed to find a tenant, and was asked by a couple of clients to visit Los Angeles to give his opinion on an unusual business. The clients were in the wholesale jewelry business, and had been selling watches to a non-profit, member-owned retail operation in Los Angeles called Fedco. When he visited Fedco, Price noticed that its facility was similar to the warehouse he had inherited. He suggested to his clients that his building could be used for the same purpose. His clients agreed, marking the beginning of FedMart and, along with previously established Fedco from 1948, the membership club industry. The business began in 1954 with a $50,000 capital investment. Price solicited the help of eight individuals, who each invested $5,000 and convinced his law firm to invest the remaining $10,000. He obtained his inventory from clients, beginning with two jewelry wholesalers. Another client, in the furniture business, provided Price with a small selection of furniture. A third client sold liquor, giving Price's FedMart the odd merchandise mix of jewelry, furniture, and liquor. He opened membership to government employees of all levels—federal, state, and local. Despite the less than comprehensive selection of goods, Price's business thrived, collecting $4.5 million during its first year, four times the total projected by Price and his investors. Success spawned the establishment of other warehouse stores and a more coherent merchandising strategy. FedMart developed into a chain of stores, and Price pioneered several innovations in the retail industry. FedMart became the first retailer to sell gasoline at wholesale prices. The chain was the first to open an in-store pharmacy. FedMart also opened in-store optical departments, establishing a format that was widely copied decades later. Aside from developing several industry firsts, Price guided the company into food retailing, a product line that would underpin the chain's development. Price was joined in his business by his son, Robert, who served as FedMart's executive vice-president until they sold two-thirds of the chain in 1975 to the German retail company Hugo Mann. The company was then 21 years old with sales in excess of $350 million at 40 stores. Price was fired less than a year after the Hugo Mann takeover. The store chain closed within seven years. FedMart began as a membership store by opening in an abandoned warehouse in San Diego, California in 1954. A second store was opened in Phoenix, Arizona, in 1955 quickly followed by a third store in San Antonio, Texas. A second San Diego-area store was opened in Kearny Mesa in 1958 followed by opening of other stores in San Diego and Southern California. 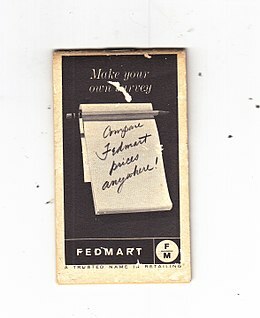 Membership requirements were dropped in the sixties and FedMart become a non-membership discount store. By 1975, FedMart had 44 stores in California, Arizona, New Mexico, and Texas. In 1969, the company became public, and its stock traded on the American Stock Exchange. Hugo Mann began purchasing stock in the company in 1975 and obtained a controlling interest in the Spring of that year and finally increased its holding to 68% later that Fall. It was not until 1981 that Hugo Mann was able to obtain the rest of the stock and take the company private. After obtaining a controlling interest in FedMart, Hugo Mann pumped more money into the company to enable rapid expansion. Besides building new stores, FedMart purchased the 22 store West Coast division of Two Guys from Vornado in 1977 (California) and the 10 store Globe Store chain from Walgreens in 1978 (Arizona and Texas). FedMart had approximately 70 stores by 1979. 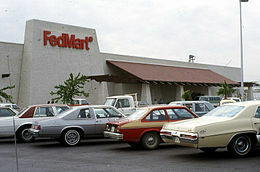 By the early 1980s, FedMart began to lose money and started to close stores, mostly outside of California. There were 46 stores left when Hugo Mann decided to close the chain in 1982 and lease the store locations to other retail firms. 35 of the locations were leased to Target and the rest were leased to Ralphs Grocery Stores. The closing of FedMart allowed Target an entry into the highly competitive Southern California marketplace. FedMart was also one of the first large scale retail stores on the Navajo Indian Reservation. It was located in Window Rock, Arizona. In 1979, the German president of FedMart was outraged upon discovering that FedMart was selling books about Nazi Germany at its stores in the US. He immediately banned the sale of all books on "political issues that are highly controversial", including books about Jimmy Carter, Richard Nixon, and the Democratic Party. ^ a b c Jakobson, Cathryn (December 4, 1988). "They Can Get It for You Wholesale". The New York Times. ^ Markowitz, Arthur (August 22, 1988). "Discounting Hall of Fame: Sol Price: his deeds speak louder than words - founder of Price Club". Discount Store News. 27 (17). Business Insights: Essentials. Gale A6580396. Under Price's leadership, FedMart became the leading discounter in Southern California, a highly competitive market that saw a host of chains fail. FedMart's chance to expand from a regional chain to a national retailer came in 1975 when Hugo Mann, a West German retailing giant, made an offer for the $350 million, 40-store company. ^ a b c "First FedMart set up shop in 1954 in abandoned warehouse". Los Angeles Times. September 21, 1980. p. h8. (Subscription required (help)). Cite uses deprecated parameter |subscription= (help) Alternate Link via ProQuest. ^ "Fed-Mart Holders Clear Purchase by Retailer Of 300,000 New Shares". The Wall Street Journal. August 7, 1975. p. 27. (Subscription required (help)). Cite uses deprecated parameter |subscription= (help) Alternate Link via ProQuest. ^ Bry, Barbara (February 18, 1981). "Largest Holder Plans to Take FedMart Private". Los Angeles Times. p. g1. (Subscription required (help)). Cite uses deprecated parameter |subscription= (help) Alternate Link via ProQuest. ^ "Vornado, Fed-Mart Expand Their Talks To Include Merger". The Wall Street Journal. July 26, 1977. p. 27. (Subscription required (help)). Cite uses deprecated parameter |subscription= (help) Alternate Link via ProQuest. ^ a b c Bry, Barbara (February 4, 1979). "Fed Mart Marketing Plan: Fast Turnover and Rapid Expansion". Los Angeles Times. p. g3. (Subscription required (help)). Cite uses deprecated parameter |subscription= (help) Alternate Link via ProQuest. ^ "Fed-Mart buying out 10 Globe units". WWD. 136 (116). June 13, 1978. p. 20. Link via ProQuest. ^ "Fedmart Retail Chain". The New York Times. April 29, 1982. ^ Hiltzik, Michael A (April 29, 1982). "FedMart Will Close All 46 Stores; 8,000 to Lose Jobs: FedMart: Discount Chain to Close All Its Stores". Los Angeles Times. p. b1. (Subscription required (help)). Cite uses deprecated parameter |subscription= (help) Alternate Link via ProQuest. ^ "Target to Reopen 35 Fedmart Stores". The New York Times. August 7, 1982. ^ a b Yoshihara, Nancy (January 11, 1983). "Target Plans to Hire 6,000 in Southland". Los Angeles Times. p. e1. (Subscription required (help)). Cite uses deprecated parameter |subscription= (help) Alternate Link via ProQuest. ^ Bry, Barbara (August 4, 1982). "15 FedMart Stores May Be Taken Over by Ralphs Markets". Los Angeles Times. p. sd_a1. (Subscription required (help)). Cite uses deprecated parameter |subscription= (help) Alternate Link via ProQuest. ^ Smollar, David (September 18, 1979). "Rise, Fall of FedMart Books". Los Angeles Times. p. sd_a1. (Subscription required (help)). Cite uses deprecated parameter |subscription= (help) Alternate Link via ProQuest. This page was last edited on 2 November 2018, at 15:41 (UTC).